Moussa Sarr is an artist drawing uncomfortable racial taboos out from under the carpet. His autofilmage vignettes confront the viewer with notions of ‘the primitive’ that have been diluted or repressed by social mores but, as Sarr highlights, are far from extinguished. See how in 2007 Sarr touches a nerve with his play on post-coital tristesse in the poignant silence following his When-Harry-Met-Sally monkey performance in L’Orgasme du Singe. A 30 second stare direct to camera following his release presents an uncomfortable challenge for the viewer to hold, giving space to reflect on the persistence of phenomena such as ‘monkey-chanting’ that still continue in football culture today. 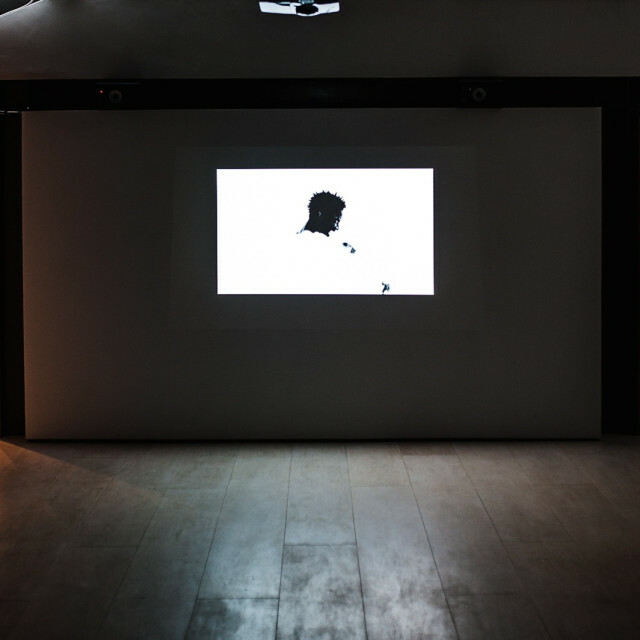 Or in Fredi La Mouche from 2010 whose references, from Metamorphoses to The Fly, take a back seat as Sarr’s pithy man-as-insect generates a physical counterpoint between the narratives of threat and pity, or violence and vulnerability, projecting deep-seated phobias literally ‘in your face’ as a spectator. And in The Frog and the Scorpion we can see Sarr’s 2012 performance evolve into a more stylised game with his own self-image, an activity seen by the artist as a “cliché to wring the neck of clichés”. Here the more overt duality of the two personas continues the oppositional thread of black and white, perpetrator and victim, life and death, this time using video pre- and post- production as more conscious tools in his laconic repertoire. Sarr’s videos are uncompromising and direct. The short vignettes, always with himself as subject, force the viewer to engage with uncomfortable subjects, with a directness and energy that makes him a unique voice. Marc Fassiaty’s collection provides Cecilia Brunson Projects with a unique opportunity to track the course of an exciting artistic practice through six pivotal video works. It also allows us to step into Fassiaty’s shoes and explore a private relationship between collector, artist and an evolving body of work. Born in 1984 in Ajaccio, Corsica, Moussa Sarr lives and works between Paris, Hyères and London. His practice incorporates video, sculptures and photography. Recent exhibitions include Le Fresnoy, Palais de Tokyo and the Boston French Film Festival at the Museum of Fine Arts Boston. His work is in important European video collections including Centre Pompidou, Paris, Collection François Pinault, Collection Yvon Lambert, Fonds National d’Art Contemporain, Paris, and FRAC Paca. French collector Marc Fassiaty has been collecting video art for over 15 years. His collection reflects his deep passion for the medium and consists of works by well established artists (João Penalva, John Wood & Paul Harrison, Eric Duyckaerts) as well as rising stars from the new generation (Ivan Argote, Oskar Dawicki, Moussa Sarr).